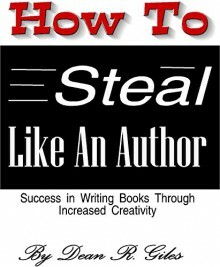 Steal Like an Author is a creativity booster for authors and others alike. Have you ever wondered why some people are more creative than others and produce more creative things than others? Principles of creativity are uncovered, activities that improve creativity are disclosed, and how to apply that creativity to writing is exposed. Everyone can be creative. Creativity is an action and a habit. First Learning to accept the influence of others, then apply creative principles to make your own projects and writing unique and fulfilling. Writing is a field that requires more creativity than other endeavors. The application of creativity to writing through exercises and example can improve anyone's results. Have you ever wanted to unleash your inner creativity and let it flow? This book will teach you how, and give you the step by step instructions for improving creativity in your life. This book will help you and teach you the practices and habits that will explode your creativity. Learn how to leverage the successful models and build on the successes of others in novel and unique ways that will extend what others have done and showcase your own unique creativeness.